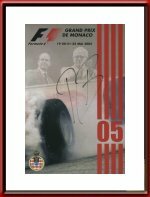 Rubens Barichello signed 2005 Monaco Grand Prix Postcard. 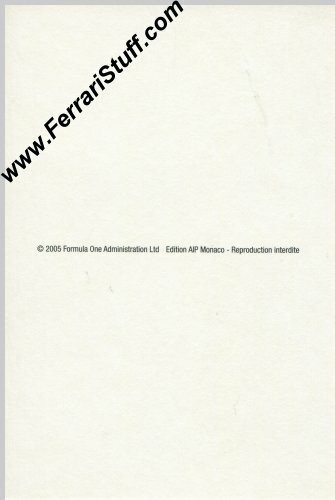 This is an official 2005 Monaco Grand Prix post card. Rubens personally autographed it "RB"on the front with a black marker. Rubens qualified his Ferrari F2005 in 10th place while his team mate Michael Schumacher managed an equally meager 8th place. The race was rather uneventful although Michael managed to plow into the rear of David Coulthard's Red Bull that had stopped due to the crashed Minardi of Cristijan Albers blocking the way. In the end, Michael and Rubens finished a mere 3/10th of a second apart in 7th and 8th place. The card itself shows father and son Prince Albert and the late Prince Rainier III. The 2005 Monaco Grand Prix was the first to be held after the death of Rainier III.